When Canadian Gail Renard was sixteen she had a life-changing experience. She lived in Montreal and in 1969 John Lennon and Yoko Ono came to town to stage their “Bed-In” protest for peace. 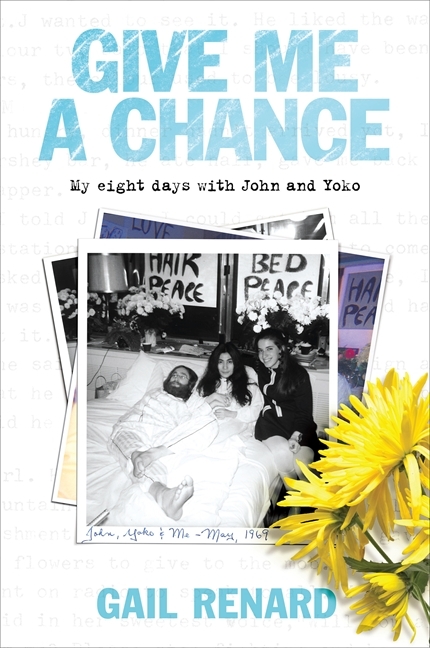 “Give Me A Chance” is a new book out now and in it Gail Renard tells her story of meeting John and Yoko and spending eight amazing days with them as their guest and helper in room 1742 of the Queen Elizabeth Hotel, Montreal. Afterwards, John gave her his hand-written lyrics for the song . These were written out with a black magic-marker pen on a big white cardboard square. These became the cue sheet for the crowd in the bedroom during the recording of the song in Suite 1742. 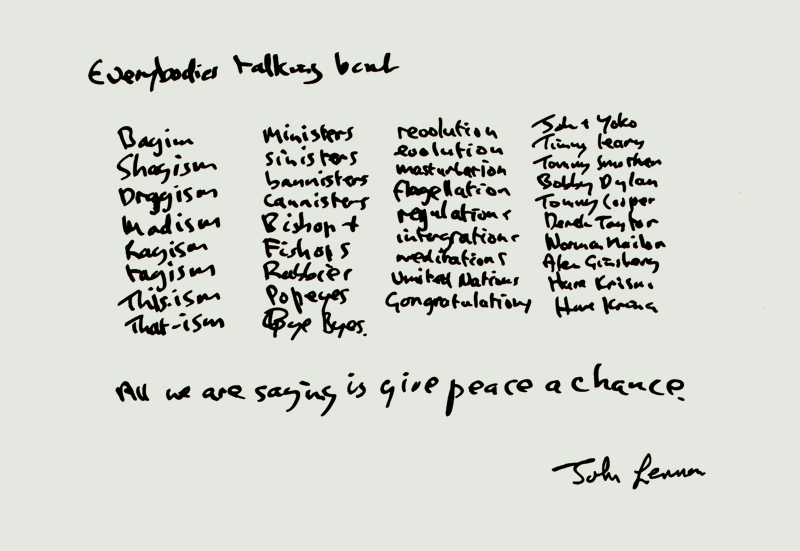 In 2008, Gail sold the “Give Peace A Chance” lyrics at a Christies auction for £350,000. She says “Thank you, John. And thanks for not throwing them out, Mother!” She’s since been back to the room where it all happened over eight days in 1969 and writes about that visit here. 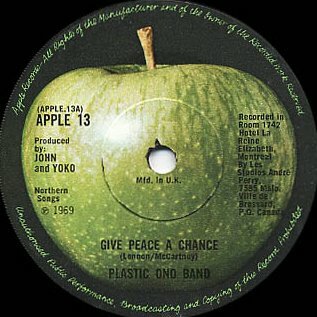 In many ways the book “Give Me A Chance” is very like an earlier book about a similar transformational experience with the Lennon’s – this time for a fourteen year-old boy named Jerry Levitan – who snuck into their Toronto hotel room and attended the Toronto version of the “Bed-In” for peace. He wrote a book about his experiences called “I Met the Walrus“. Thank you to Beatles collector Bruce Hamlin for sending me a copy of this book. It’s richly illustrated with photographs and memorabilia and is a great little read! This entry was posted in Beatles, Beatles Books, Beatles Collecting, Beatles Related, John Lennon, Yoko Ono and tagged Beatles, Beatles Books, Beatles Collecting, Beatles Remastered, Give Me A Chance book, John Lennon, Yoko Ono by beatlesblogger. Bookmark the permalink.